Home/Latest News/What a Wren, a Goat, a Snake and a Dog Have in Common! Signs and messages from the Animal Kingdom are quite familiar to me. However, I rarely get four powerful messages in one day, and recently, that’s just what happened. 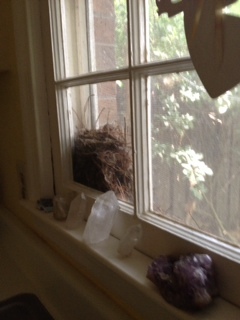 I share that rare morning with you in hopes that you might be guided to pay more attention to Nature messages that come to you! The common ground in their messages was: I am transforming into the person I am meant to be, doing the work I’m meant to do. I need to shed old patterns, invite new adventures into my life, and procedure with sure-footedness! 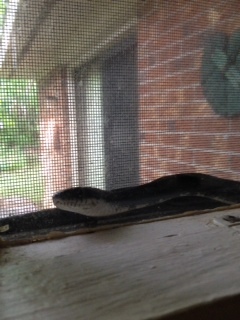 The King Snake who climbed between the window and screen on my other kitchen window taught me that I am experiencing the “energy of wholeness, cosmic consciousness, and the ability to experience anything willingly and without resistance…. Through accepting all aspects of your life, you can bring about the transmutation of the fire medicine. This fire energy, when functioning on the material plane, creates passion, desire, procreation and physical vitality. On the emotional plane it becomes ambition, creation, resolution and dreams. On the mental plane it becomes intellect, power, charisma, and leadership. When Snake energy reaches the spiritual plane, it becomes wisdom, understanding, wholeness and connection to the Great Spirit. This is heavy magic, but magic is no more than a change in consciousness. Become the magician or the enchantress: transmute the energy and accept the power of fire.” Medicine Cards by Sams and Carson. 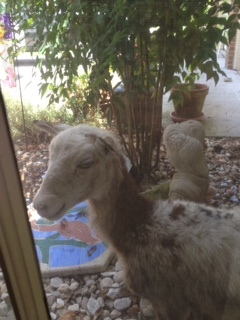 A Goat, chased by a Dog, took shelter next to my front door. “Goat’s medicine includes abundance, independence, surefootedness, eliminating guilty feelings, understanding nature energies and beings, seeking new heights, agility. The goat shows us how to compose a firm foundation on which to stand and aids us in developing confidence as we head towards new. Goat teaches us how to create a solid foundation on which to stand and helps us develop confidence as we move towards new heights achievements.” www.shaman’sjourney.com. If you’d like to learn more about your Animal Guides, check out my SERVICES page to learn how I offier Animal Guide readings.